1. Cut the potatoes into 1/2-cm thick slices. Next, cut each slice into sticks that resemble the shape of French fries. Keep them as uniformly sized as possible so that they cook evenly. 2. Preheat the oven to 400 F. Place the potatoes along with all of the other ingredients in a large bowl. Using a rubber spatula, toss everything together very well so that the potatoes are evenly coated with the seasonings and oil. 3. Place the potatoes on a nonstick (or lightly oiled) cookie sheet, scraping all of the seasonings onto them with the spatula. Spread the potatoes out over the pan so that none are overlapping. Bake for about 10-15 minutes. Turn them over with a heat proof spatula, then bake for another 10-15 minutes or so (or until they are delectably browned on both sides). Serve immediately. I love Fresh’s sweet potato fries, too! I have them every time I go to the restaurant. . . which may be why I’ve not had any “misses” there yet! 😉 Thanks for submitting this to WW this week. Sounds like a great BBQ! You should be able to find nutritional yeast at most health food stores. I haven’t seen it at the big box grocery stores just yet unfortunately. Definitely let me know if you try the gravy- it is very nice! THanks! Will let you know how it goes… I love miso, I’m sure this gravy will please me very very much! Such an interesting recipe…. These sound exactly like the type of sweet potato fries I’ll be getting addicted to this week…and I’m pretty glad I don’t need to go to canada to have them! That miso dipping sauce sounds PERFECT. 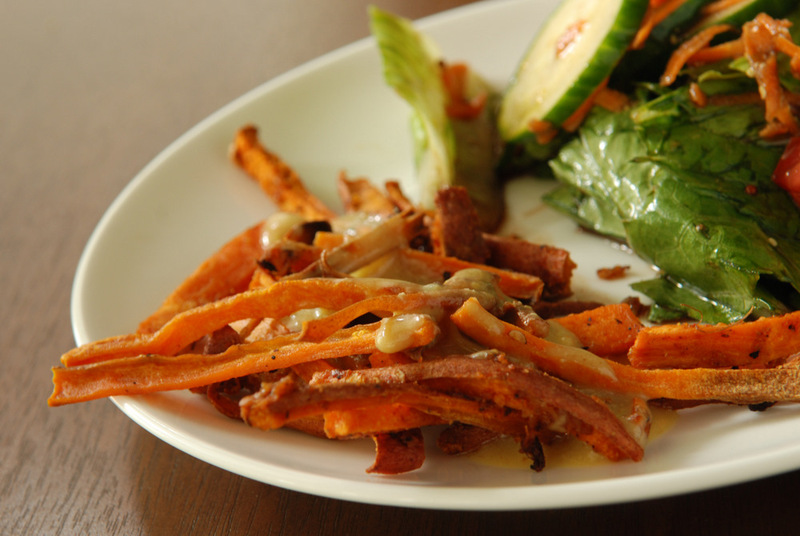 That plate of oven-baked sweet potato fries looks very nice. 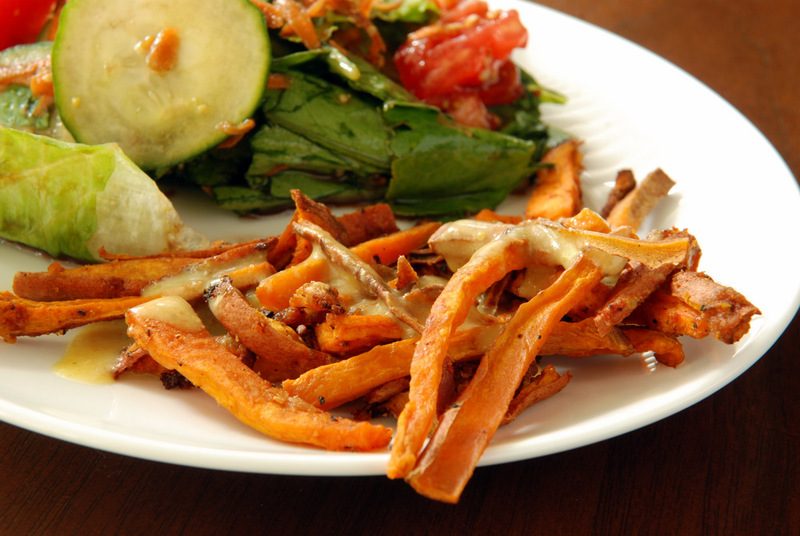 Ah those sweet potato fries look so good! I’m going to have to try that miso gravy. I have the other Fresh cookbook but not this one.